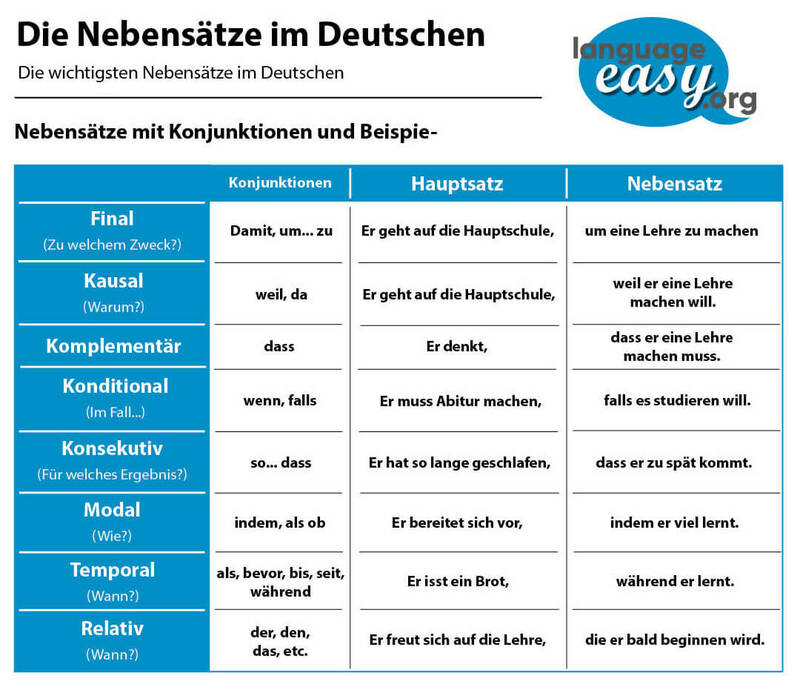 Welcome everybody to language-easy.org and this article about German subordinate clauses. Well, some of you might have notices that the German language can be rather complicated. Unfortunately, it becomes worse the deeper you enter this strange and irregular world of German grammar. Of course, watching movies in German or reading books can be really useful. But, in the end of the day, you will not be able to avoid sitting down on your desktop and study your German grammar book. Well, there is nothing else you can do apart form learning the basic elements of German step by step. So, by having clicked on this article about German subordinate clauses, you have chosen one of the most difficult topics in German Grammar. In the following, I’d like to give you a overview about the different types of German subordinate clauses, their meaning and their use. Hopefully, my explanations and examples will be of some use for you. Well, let’s start right ahead with some definitions and explanations. What are German Subordinate Clauses? Was sind Nebensätze im Deutschen? First of all, we will define what German subordinate clauses actually are. So, you will see that they are quite similar to subordinate clauses in the English language. Nevertheless, there are huge, important difference you have to consider. German subordinate clauses, also known as dependent clauses, are building blocks of a compound sentences. So, this means that a German subordinate clause can not stand alone. Well, it always is connected to the main clause and separated by a comma. Furthermore, the finite verb of the subordinate clause stands at the end of it. In case, the German subordinate clause is in front of the comma, the position of the infinite verbs changes to the beginning of the phrase. By the way, most of the German subordinate clauses are connected with the main clause by a conjunction. So, after all this information, have a look at this short formula for the standard sentence structure. Of course, it can be really hard for English speaking people to put the verb at the end of the phrase. Unfortunately, I can’t give you any explanation that would explain this word order. Anyways, this topic need a lot of hard studying – there is no way around it. Now, we have reached the most important part of this article, the different types of German subordinate clauses. By the way, this article just treats about teaching some overview and basic information about subordinate clauses. So, in case you’d like to know more about a specific type of German subordinate clause, just click on the button under the overview of each clause. 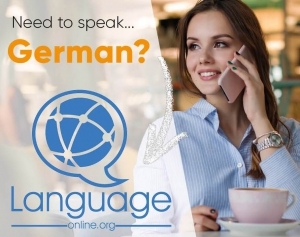 Apart from the different types of German subordinate clauses, we will also talk shortly about the most common conjunctions and the indirect speech in German, which can also be considered as a subordinate clause. First, we will talk about the grammatical element that connects the main and the subordinate clause, the conjunctions. So, there are two categories of conjunctions. Subordinating conjunctions and con conjunctional adverbs connect main clauses with subordinate clauses. So, note that the type of conjunction also influences the sentence structre. Well, just click on the button under this really short overview about conjunctions to get further explanation, examples and lists of the different kinds of German conjunctions. As a next kind of German subordinate clause, we will have a look on indirect questions. Of course, all of you know that German indirect questions are questions that are included within the structure of another sentence. In order to get to know how to use them and also the introductory phrases they come after, just click on the button under this text. Third, there are infinitive clauses. So, you can define these kind of subordinate clauses as dependent clauses which are constructed with the infinite from a verb and the prepositions “zu”. Well, in order to learn how construct his type of German subordinate clause, learn how to use them and master their rules, just click on the button under this description. Fourth, we have a German subordinate clause called participle clauses. So, in the kind of subordinate clauses you can use.. Most important, they always refer to the subject of the corresponding main clause. Although this kind of German subordinate clause is rather rare, you can find them in novels but also sometimes in speech. Of course, just click on the button under this text for detailed information. As a fifth type of subordinate clause, let’s have a look at relative clauses. So, these German subordinate clauses allow us to get additional information about a topic without starting a new sentence. Well, in this context you will have to master German relative pronouns as well, because they are the beginning of the clause. Please, click on the button down here for more information. Well, the sixth German subordinate clause you should know is the conditional clause. Conditional clauses express that an action will only take place under certain condition and they mainly describe realistic situations but also hypothetical ones. Of course, you can find all the information you need to master this kind of German subordinate clause in the article below. Just have a click on the button. Finally, we have reached the seventh and last kind of German subordinate clause. Well, it’s the indirect speech! For sure, all of you know that you use it to report what other people have said. But do you know exactly how to form and use it in the German language? If not – don’t worry. Just click on the button below and you will find a useful guideline for German indirect speech. An adverb is a word that modifies the meaning of a verb, and an adverbial phrase is a combination of words that perform the same function. So, in case you’d like to know more about this type of subordinate clase, just click on the button. German attributive clauses are subordinate sentences which have the function of a a attribute, which means that they depend on a noun. And also this subordniate clause is described in some more detail in the following article. A German conjunctional clause is a dependent sentence that is always initiated by a conjunction. For further explanations and and examples have a look at the following article.